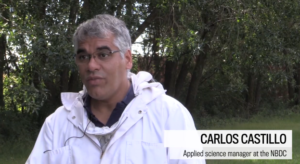 Northern Alberta Scientists Looking at Bees dying. Our very own President, Craig Toth got some media attention with his work helping northern Alberta scientists. Ever heard of a honey bird? Nasty pieces of work if you ask me because they are all brood parasites that lay one egg in a nest of another species. Honeyguide nestlings have been known to physically eject their host’s chicks from the nest and they have hooks on their beaks with which they puncture the hosts’ eggs or kill the nestlings. Honeyguides are named for a remarkable habit seen in one or two species: they guide humans to bee colonies. Once the hive is open and the honey is taken, the bird feeds on the remaining wax and larvae. 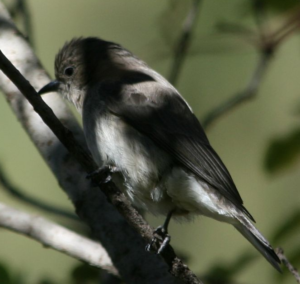 They are among the few birds that feed regularly on wax—beeswax in most species. Do Bees Dream of Electric Flowers? A new study suggests that bees can store information in long-term memory while they sleep, just like humans do when we dream. Similar to our circadian rhythm, honeybees sleep between five and eight hours a day. And, in the case of forager bees, this occurs in day-night cycles, with more rest at night when darkness prevents their excursions for pollen and nectar. 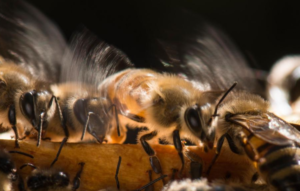 Without a good night’s sleep, then, honeybees start to forget the activities that should be second nature to them. And in a study released in 2015, Randolf Menzel and his colleagues from the Free University of Berlin provided a possible explanation as to why this might be. 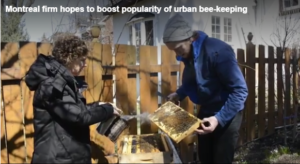 A Montreal-based company is renting out beehives to people who are interested in making their own honey and to learn more about beekeeping. Once rented, the company places hives in either a backyard, a balcony or a flat roof. The renting period lasts one year, and costs $65 a month. Alveole staff does all the beehive maintenance. We are very thankful for the following people who have stepped up in our organization to lead us through the 2016-2017 year. 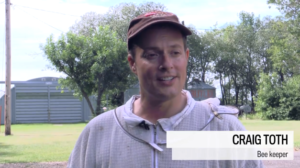 It’s people like those you see below who help make beekeeping in Edmonton and Area an amazing experience. Please thank them, next time you see them. 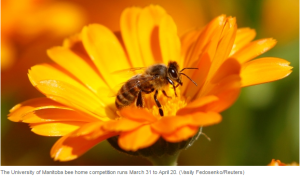 The University of Manitoba is hosting an international design competition called BEE/HOUSE/LAB, challenging people to create imaginative and functional houses for solitary bees. I hope this mild winter was healthy for your hives and your families. First of all I would like Crystal Samborski – your new treasurer – for donating a huge box of microscope “goodies” which will be used by the club for many years to come- slides and sample bottles and cover slips to name just a few. Thank-you Crystal for your generous donation! I hope this mild winter was healthy for your hives and your families. I will be bringing the club microscope to the March EDBA Meeting at Beemaid if anyone would like to look at hive samples of bees. This is a good time to examine bees from a deadout hive or from the normal dead bee die out in front of the hive. To view nosema spores it is not necessary to put the bees in alcohol if the bees were frozen before bringing the sample to the meeting. However if the bees have to be kept for a short time at room temperature ,add isopropyl alcohol to your sample. Bring a sample of 5 bees to get an idea if your hives were infected with nosema. Bring your bees in a sealable baggie or bottle labelled with your name and email address and hive identification. If time runs out I will add alcohol to the bees and examine them later and send you a photo.